Rediscover the lost Vassir-Didanat Ebony Mine, and report it to one of three Hlaalu Councilors. 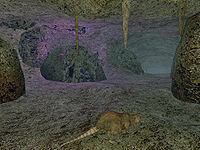 Rediscover the Vassir-Didanat Cave south of Balmora by simply entering the cave. This opens a dialogue option with three House Hlaalu councilors. Choose who you'd like to speak to, and claim your reward. Rather than beginning with a particular person, this quest actually begins at a location. You can find the Vassir-Didanat Cave to the south of Balmora, on the other side of the river. If you have done the Fighters Guild quest to eliminate the egg poachers from Shulk Egg Mine, you may have seen the bridge across the river just to the south of the eggmine. Cross the bridge and keep going east, and you should see the cave on the hillside. The cave was actually a former ebony mine which has become lost after one of the miners apparently summoned a daedra that killed everybody inside the mine. Once you enter the cave you've essentially 'rediscovered' it and open up the dialogue option Vassir-Didanat Mine with three Hlaalu councilors. Of course, feel free to take any ebony that you like for a good amount of gold as they're 200 gold each. However, even though you will still be able to take it after the completion of the quest (as no guards will appear in the mine), you might rather want to leave it if you are not strong enough to face the atronachs inside. Dram Bero (Haunted Manor, on the Plaza of St. Olms), who will offer you a choice of Daedric weapons: a katana, a bow, a staff, a wakizashi, a spear or a battleaxe, depending on which weapon skill you tell him you prefer. Be aware that if you go to Nevena Ules first, the others will not give you anything, as they don't trust her. You may also report it to Crassius Curio in Vivec's Hlaalu canton. He will say that it's outside his jurisdiction and will recommend that you report it to either Dram Bero or Velanda Omani, but will not mention Nevena Ules. Lower level characters should be careful, as the cave may be home to an atronach or two, along with rats which may or may not be diseased and/or blighted. All you have to do is enter and exit the cave, making it an easy way to receive a Daedric weapon early on. There are multiple lockpicks at the bottom of a small, round, table in St. Olms Haunted Manor which may be required to open the locked door to get to Dram Bero. If you go to Dram Bero: the bow or the battle axe are very rare compared to the others, and so may be a good choice. There is no direct journal entry for entering the mine but it should give you the conversation topic. 100 Velanda Omani gave me 2000 gold for telling her the location of Vassir-Didanat. 110 Dram Bero rewarded me for telling him the location of Vassir-Didanat. 120 Nevena Ules promised me great riches for telling her the location of the Vassir-Didanat mine. This page was last modified on 10 January 2017, at 05:46.